Ernest Sports revolutionizes the game with a great new tool for teaching professionals, club fitters, and serious golfers. The ES14 delivers critical data instantly, easily, and affordably. The ES14 puts the power of creative technology in your hands providing you with critical information to improve any golfer's game, including club speed, launch angle, ball speed, smash factor, spin rate, and distance. The ES14 is an ideal tool that provides instant audible feedback, the ability to practice as a pro, motivate, and pick up where you left off. 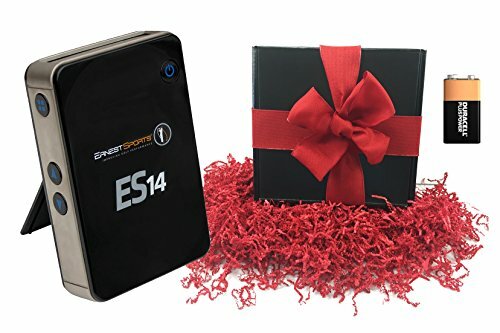 The ES14 is a portable launch monitor that provides for an enjoyable and informative golf experience. Combined with the Ernest Sports app, the ES14 is great for golfers of all levels of expertise. From junior golfers to scratch golfers, this system incorporates technique with enjoyment, bringing new life to your golf game. This complete package includes range data, scorecard, video analysis, Bluetooth audible feedback, and much more. ADVANCED GOLF TRAINING - The ES14 is an ideal tool for golfers that provides instant audio and visual feedback, the ability to practice as a pro, motivate, and pick up where you left off. PRECISION DATA - Provides accurate data on club speed, launch angle, ball speed, smash factor, spin rate, and distance. PERFECT GIFT - the ES14 Gift Box is perfect for the golfer who wants a more calculated, data-driven approach to their game. Throw the extra 9V battery in their golf bag to ensure they're never without a fully-powered unit! If you have any questions about this product by Ernest Sports, contact us by completing and submitting the form below. If you are looking for a specif part number, please include it with your message.